Reformation Day and Halloween always fall on the same day: October 31st. But only once every five or six years do they fall on a Sunday. This year, is one of those special years. We get to celebrate both the Reformation and Halloween on Sunday – the Lord’s Day! While Halloween may not be a religious holiday, the root of the name “Halloween” comes from the Old English “All Hallows Eve.” Something ‘hallowed’ is something ‘holy’ … and the word “saint” can be roughly translated: “holy one.” Therefore, “All Hallows Eve” is the eve of (or day before) All Saints’ Day, a festival in the church year when we celebrate and commemorate those who have died and gone before us in faith. So then, it’s no surprise that on October 31, 1517, Martin Luther posted his now famous “95 Theses” on the doors of All Saints’ Church (also known as the Castle Church) in Wittenberg, Germany. He did this not as an act of vandalism or defiance, but rather as an invitation. It was customary in those days to post public notices on the doors of the church. In this case, Martin Luther, a Catholic monk and also a university professor, was hoping to reach the large crowd of worshippers that would attend church on All Saints’ Day. Luther’s intention was never to divide the church, but instead to debate what he believed were errors in theology and practice that had crept into the church. Nevertheless, the Pope and other church leaders determined that Luther’s discussion points were heresy and excommunicated him from the church. During Luther’s trial at the Diet of Worms (1521), he was asked to recant his teaching, but his response was instead, “Unless I am convinced by proofs from Scriptures or by plain and clear reasons and arguments, I can and will not retract, for it is neither safe nor wise to do anything against conscience. Here I stand. I can do no other. God help me. Amen.” And thus began what is known as the Reformation. To this day churches in the Lutheran tradition follow the clear teachings of Scripture as their only basis of teaching and doctrine. We, with Luther, stand on the Word of God and the promises of Christ as our only assurance of salvation. You can read more about the Ninety-Five Theses at: http://tinyurl.com/The95. Where is Assyria on the Map? Q: Someone recently asked me, “I am having a hard time finding Assyria on the map. Can you help me?” They also admitted that it’s confusing that the Bible talks about Assyria, Syria and Samaria, and the names are kind of similar sounding. A: It’s important to note that Assyria is the name of an ancient empire, and therefore modern maps show the names of current nations that are in the same lands that Assyria once occupied. The area that was once Assyria is now regions predominantly in Iraq, Iran and Turkey. 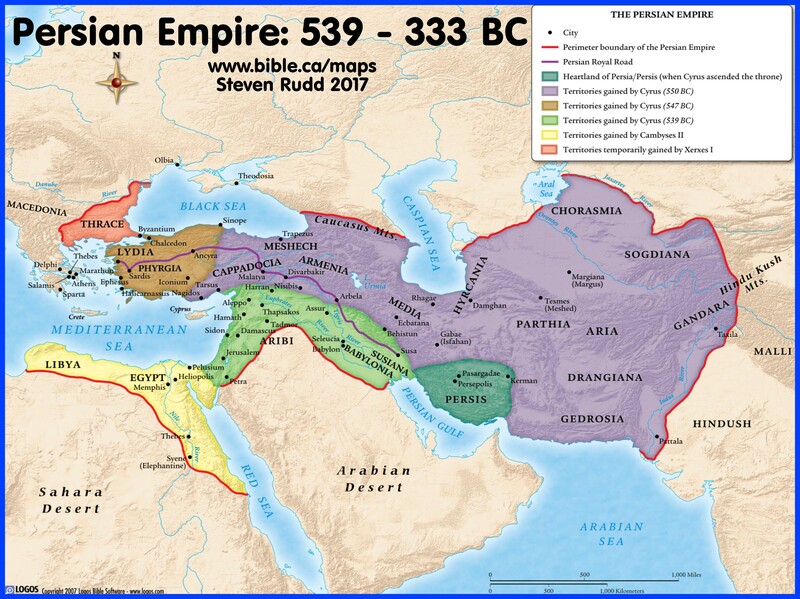 this link will show you where “Syria” and “Samaria” (if you look very carefully) is in relation to Assyria: http://www.bible.ca/maps/maps-near-east-500BC.jpg, It also shows the Babylonian and Persian empires for reference.